Umhlanga Rocks is located along the shoreline, north of Durban. In this area there is the famous Gateway shopping centre and plenty of activities to take part in. This city has a rich history and a lot of heritage sites that you can visit. “Umhlanga” means the place of reeds in the South African Zulu language. Umhlanga Rocks is a very popular tourist destination because of its beaches, holiday resorts and heritage sites. Umhlanga Rocks was originally the home of the San hunter-gatherers and was later also explored by Nguni tribe, who were united under King Shaka in the early 1800s into the proud Zulu nation. Soon after that the Umhlanga area became under British control. The first hotel in this area was built in the 1920s. The lighthouse was built in 1954 to warn incoming ships of the dangerous rocks. The best time to visit Umhlanga Rocks is between the months of October and June. Summer ranges from November to February where the climate is hot and humid with temperatures from 24 to 33 degrees Celsius. Winter ranges from the months June to August where temperatures are from 12 to 22 degrees Celsius. Umhlanga Rock’s sea temperatures vary from 25 degrees in the summer to 18 degrees in the winter. The rain season is usually during spring and early summer. The Pearls hotel is one of the most well-known hotels in the area. The hotel is described as iconic, flawless, rare, valuable and luxurious. The residential resort is situated on the North Coast of KwaZulu-Natal. The Hotel is only a 10 minute drive from the King Shaka International airport. The Pearl of Umhlanga recently made an upgrade and launched the final phase, Pearl Sky. The Pearl Sky includes luxury apartments that can have up to 4 bedrooms a unit. These new apartments have a modern design plan with a contemporary style. The Pearl Sky is definitely a new way of sophisticated living. Another prominent hotel in Umhlanga is The Square Boutique Hotel. This Four-Star Hotel is positioned on the Umhlanga Ridge which provides a magnificent view of the Indian Ocean. The Square Boutique Hotel offers luxury for leisure and business travellers and also provides 50 rooms to choose from. The Cosmopolitan Restaurant adds to the modern and contemporary style of the hotel. Angelo’s Trattoria is a popular restaurant to visit in Umhlanga that serves wonderful Italian cuisine. Angelo’s is located in the centre of Granada Square. It has an indoor dining area as well as an outdoor section, which can be pleasant to enjoy warm South African evenings. Adega is also a good Portuguese restaurant to visit if you are looking for spicy food. The restaurant is known for its Portuguese-inspired foods and unpretentious style. Adega is situated in the Gateway shopping centre. Adega provides a variety of foods, like poultry, red meats, vegetarian options and seafood dishes. Because of the popularity of this restaurant, booking is essential for a meal at Adega. South Africa has a rich wildlife, which makes diving or surfing a definite option when visiting. Umhlanga’s ocean offers rocky reef formations that can take you through interesting canyons. An abundance of marine wildlife can be experienced because of reef fishes, crustaceans and invertebrates that all lives in the ocean. You may even have an encounter with the Zambezi shark. This is definitely an adventurous activity. If you are looking for something calmer, there is always snorkelling. The Hawaan forest has a lot of different tree species and it is a great option to explore if you are a bird watcher and nature lovers. The Hawaan trails are unfortunately not open to the public, but you can join a guided tour through the unique forest with a big ecosystem, including species like the bush pig, duiker, genet and even pythons. The Umhlanga Country Club has 3 sections, the Umhlanga bowling club, the ski boat club and the tennis club. If you are a sporty person, you will definitely enjoy this club. The country club also has a Conference centre that is able to host up to 200 people. Functions can be held here like, corporate events, product launches and even weddings. This market provides local produce and ingredients. Freshly picked fruits and vegetables are available. Products like dried fruit, fresh herbs, nuts, flowers, flavoured olives, free range chicken and more. Readymade meals are also available like curries and pies. There are still plenty of places to visit in Umhlanga like the Umhlanga Lighthouse, beaches, shopping centres etc. The Krantzkloof nature reserve has 2 picnic sites, the Kloof falls picnic site, which is located between the Kloof and Waterfall on the Molweni River. The Nkutu picnic site is situated along the Valley between Forest Hills and the waterfall on the banks of the Nkutu River. This picnic spot is only available on public holidays and weekends, where the Kloof falls picnic site is open every day from 06:00 to 18:00. The Reserve also has a conference centre and a number of self-guided tours. There is also popular rock climbing sites available, but you are required to sign in and pay an entrance fee before proceeding to the climbing locations. The Krantzkloof nature reserve is popular for its interesting geology and rich biodiversity. There are 253 bird species, 150 butterfly species, 35 reptiles 273 tree types and over 1500 different plant species. The Moses Madiba Stadium is the one of the most popular hosting stadiums for great events. For the first time in 93 years, the Comrades Marathon will be hosted by this Stadium in 2018. It will be the finishing venue for “the Ultimate Human Race”. The Moses Madiba Stadium is a violence-free zone and also a non-smoking venue, however there are designated areas that are clearly indicated where smoking is permitted. There is also an extra option where you can enjoy the game in VIP luxury. The package includes a suite ticket, a three-course buffet meal and a complementary standard bar. The parking ratio is 1 parking for 4 guests. uShaka Marine World is Africa’s largest Marine Theme park. They have a focus on family entertainment and they are popular for having the 5th largest aquarium in the world by volume of water. uShaka has a 1200 seater dolphin stadium where you can be entertained by dolphin shows and they feature a seal stadium too and even a penguin rookery. They host different activities like, windsurfing, paddle boat rides, dolphin viewing charters, surfing jet skiing, volleyball and also national and international beach sport events. There is a Wet and Wild World, which is a freshwater park with swimming pools, relaxing river rides and even high speed chutes. There is also smaller slides and pools for younger children to enjoy. These are just a few activities and places to visit in and around the area of Umhlanga. One of the other popular snorkelling and diving spots is the famous Vetch’s Pier. Probably because most divers can explore the wide variety of marine life, like Butterfly fish, Octopuses, electric rays, moray eels, shellfish and much, much more. There are plenty of other diving sites, snorkelling sites, nature reserves and parks to visit. 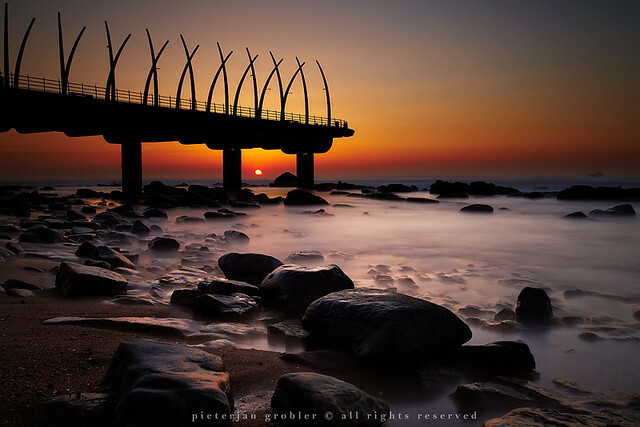 Umhlanga is one of the most thrilling, beautiful and adventurous places in South Africa. When you get the chance, be sure to visit this gorgeous location!